The final GlobE conference took place in Naivasha, Kenya on the 3rd and 4th of December 2018 with around 250 participants from African countries and Germany. In plenary presentations and exhibitions outputs from the six GlobE projects were presented. In four parallel dialogue sessions participants discussed potential uptake and upscaling of GlobE research results. Following the GlobE conference, a final workshop of the UrbanFoodPlus project took place at Egerton University on the 6th and 7th of December 2018. Over the course of 2017/2018, the Bamenda multi-stakeholder platform created a policy narrative on urban and peri-urban agriculture for Bamenda. One year after the initiation of the process, the platform met for the official presentation of the policy narrative and a discussion on how to turn it into a strategic city agenda. For this representatives of the relevant ministries, city authorities and councils, farmer associations and NGOs got together facilitated by SHUMAS and RUAF with participation from University of Göttingen and University of Kassel. Due to the on-going crisis in the Anglophone region, the meeting was held in Douala on the 15th of November. At the meeting researchers from UFP presented their research results to the stakeholders and discussed with them their implications. In particular, Annika Witte presented UFP research on the effects of biochar (work by Emily Gawum, SP2), the food-feed-wood-flow survey (by Hanna Karg, SP8), the willingness-to-pay study (by Christina Seeger, SP7) and the social perception of agrochemicals (by Annika Witte, SP6). Tobias Feldt and Jennifer Provost from University of Kassel (SP3) also presented their research results on farmer-grazier conflicts and dairy business. The meeting was also attended by external guests like GIZ and representatives from Ministry of Agriculture and Rural Development from Yaoundé and Douala that have shown interest in UPA and more especially the Bamenda multi-stakeholder process. The meeting was concluded by the creation of a core group that will continue the work on a strategic city agenda. Despite the worsening security situation in the anglophone Northwest Region of Cameroon, SP3 researchers Jennifer Provost and Dr. Tobias Feldt returned to Bamenda one very last time to meet and discuss with some dairy farmers and Mbororo pastoralists who collaborated with UrbanFoodPlus during the past two years. Following their participation and contribution in the Multi-Stakeholder Dialogue meeting in Douala some days earlier (see separate news report), the UFP researchers together with some former project assistants organized a one-day feedback meeting on the topics of farmer-grazier conflicts and dairy markets in the Asa-Neh Hotel & Restaurant in Mile 6 Nkwen Bamenda on November 18th 2018. Altogether 17 participants made it to join the meeting that was held against the aggravating background of ongoing fighting between governmental military forces and Ambazonia separatists in the region outside the city of Bamenda, a continuous, region-wide curfew from 6pm to 6am as well as an announced (and later withdrawn) one-week strike action, which made it necessary to postpone the meeting in a very short term. Despite all these adversities, a lively discussion developed on the research findings. All in all, the SP3 team left Bamenda with very mixed feelings: while admiring the peoples’ gratitude and joy of (too short) reunion, the near future of this UFP project region stays completely unclear. It is hoped that further escalation can be avoided and peace and normal life may soon return! SP3 PhD student Jennifer Provost presenting results from her dairy market research. A lively discussion developed amongst the participants of the SP3 feedback meeting. Participants group picture (Jennifer Provost is taking that photo and therefore missing). Dr. Tobias Feldt (first from the left) and Jennifer Provost (third from the right) together with their research assistants (from left to right: Edwin Njoyee, Vandolin Nabi, Claris Foncha and Julius Forchid). 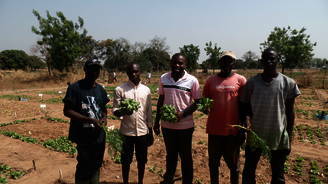 The policy narrative on urban agriculture in Bamenda is now available online. The policy is a collaboration between the members of the Bamenda multi-stakeholder platform, UFP researchers from SP 2, 3, 6, 7 and 8 as well as RUAF and SHUMAS. The policy was developed based on the first Bamenda stakeholder dialogue platform and was discussed at a core group meeting held in Bamenda in March 2013. 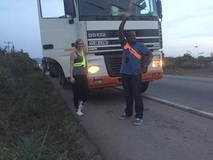 To better understand social and organisational factors influencing food trade across borders, Edmund K. Akoto-Danso (SP2) and Hanna Karg (SP8) travelled with an articulated truck carrying rice, originally from India, from the port in Tema, Ghana, to Ouagadougou, Burkina Faso. The trip took place from 21 - 26 February, 2018. 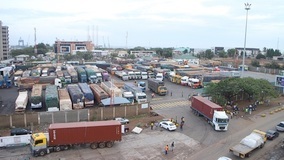 The team spent four days on the road and two days at the Ghana – Burkina border and faced various challenges, including delays caused by equipment malfunction and numerous checkpoints on the route most of which are managed by the Police Service and Customs. For the journey of 920 km, they counted about 108 checkpoints, the large majority in Ghana, run by these institutions as well as various tollbooths (12) and weighing bridges (10). Informal interviews revealed that drivers employed by transporting companies or organised in drivers’ unions experience far less harassment than drivers transporting local goods who are not backed by a powerful institution. The difficulties that local food transporters face affect cross-border trade in the ECOWAS region, a sector with a high potential of offering employment along the entire supply chain. A report and a documentary of the trip will be uploaded soon! Researchers from SP3 returned to Bamenda for another field visit between March and May 2018. To complete his data collection on farmer-grazer conflicts in the region, Dr. Tobias Feldt took off all remaining GPS collars from the six representative Mbororo cattle herds that had collected data on the animals’ annual transhumance movements as well as on their grazing ranges both in the temporary dry season zones and rainy season home grazing areas during the transhumance seasons 2016/17 and 2017/18. In the meantime, local assistants had executed an intensive survey of 166 randomly selected cattle-owning Mbororo households, interviewing household heads on issues concerning herd management, land ownership, access to grazing and water resources, transhumance habits, stocking densities, major challenges in general and farmer-grazer conflicts in particular. The survey covered a 70x70km investigation area in which extensively managed cattle herds were supposed to still directly supply urban and peri-urban beef markets in and around Bamenda. The household survey partly took place in very remote areas and was supplemented by asking the interview partners about their herds’ current and past transhumance zones and corridors. The information were directly registered in digital form using Google Earth software and mapping applications for smartphones. Between March and April 2018, BSc student Leon Bessert from the University of Göttingen successfully complemented the investigation on farmer-grazer conflicts by 40 interviews with crop farmers along four major transhumance zones for also perceiving the perspective of the second conflict group. Data collection was performed within the framework of his bachelor’s thesis. Finally, completing the study of SP3 PhD student Jennifer Provost on milk markets and value chains, Nepalese MSc student Raja Mehta, likewise from the University of Göttingen, carried out a comparative investigation on food security and diet quality of cattle-owning households that produce and sell milk (n=150), such that produce but do not sell milk (n=150) and non-cattle-owning households (n=150) in the framework of his master’s thesis. This approach followed a similar work realized in Bamako in 2016 and will help to compare these two study sites concerning dairy markets and food security. Despite the deteriorating security situation since late 2016 in the two anglophone regions of Cameroon, seeking for more autonomy or even independence and meanwhile involving side-effects such as nighttime curfews as well as intensified controls and checkpoints by national security forces, SP3 staff succeeded to complete data collection while sending a strong sign of support to local partners and friends to not forsaken them despite this difficult situation. Discovering Ngembo transhumance zone (between Bali-Nyonga and Mbengwi) with MBOSCUDA-colleague Mohammed Bawuro. BSc student Leon Bessert (right), Cameroonian assistant Edwin Njoyee (left) and a local contact person in Muju transhumance zone near Big Babanki. MSc student Raja Mehta (right) visiting a good example for alliance farming in Ndop transhumance zone: local farmers collecting manure from an already deserted transhumance corral to use it on their fields. A technical and multi-stakeholder workshop was conducted at UDS Tamale Campus from March 7 – 9, 2018. On the first day several UFP scientists presented major research findings, and in the evening project participants were invited for a discussion at the local radio station in Tamale. The second day started with a short keynote address by Mr Iddrisu Musah, Mayor of Tamale, which was followed by a stakeholder workshop, facilitated by Rene van Veenhuizen (RUAF) and Zakaria Abdul-Rashid (UrbaNet). The stakeholders included city authorities, traditional authorities, national reserach institutions, Ministry of Food and Agriculture, farmer unions, food vendors, transport operators, local NGO's and financial institutions. The stakeholders discussed UFP research outputs and the way forward for a Strategic City Agenda for Urban Agriculture Development in Tamale. The last day was dedicated to a field visit of the Central Field Experiment in Zagyuiri, and a city tour to visit the main markets of Tamale. The Workshop was coordinated by Dr. Abdul-Halim Abubakari (UDS) and Dr. Sophie Graefe (UFP). In late 2017, SP3 (represented by Dr. Tobias Feldt) induced another round of GPS herd tracking and pastoral household interviews to add information to the so-far collected data on farmer-grazer conflicts in Northwest Cameroon. Like is has already been done one year before, the same six Mbororo cattle herds were attached with GPS radio collars in late November to follow the animals’ movements and to define their transhumance zones and corridors during the dry season 2017/18. As the transhumance season is supposed to start in late December or early January, the newly collected information will either confirm last year’s spatial data or prove a shift of location. The data actually collected by the use of the GPS collars will be completed by detailed map-based participatory interviews with local pastoralists. A similar study was already carried out in April 2017 but did not achieve satisfying results. This time, an area of 70x70 km was defined around Bamenda, oriented on the spatial extension of transhumance zones and home pastures of the six above mentioned reference herds. Within this survey area, all present pastoral Mbororo communities (so called ‘Ardorets’) and the transhumant cattle owners within were identified and four persons per Ardoret were randomly selected to answer various questions, this time more focused on transhumance corridors and areas, stocking rates, conflicts and restrictions. In the end, this should lead to more than 180 pastoral interviews. Ongoing data collection is carried out by four motivated local assistants and will be completed until late February. Visiting a Mbororo home pasture in Acha, west of Bamenda. Carrying out interviews on farmer-grazer conflicts in a Mbororo compound north of Santa. Getting connected to potential interview partners at the weekly Acha Cattle Market. The presence of heavily armed soldiers in the background is proof for the ongoing political crisis in the both anglophone regions of Cameroon. Some research results generated in the UrbanFoodPlus project were presented to a wide audience at the Global Food Security Conference in Cape Town from 3-6 December 2017. 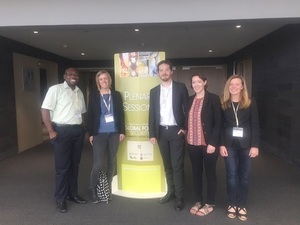 Edmund K. Akoto-Danso (SP2), Carla Swertz, Tobias Thürer, Christina Seeger (all SP7), and Hanna Karg (SP8) presented their findings on consumers' willingness to pay for certified safe vegetables, cost-of-illness among urban farm households, urban food provisioning and virtual water flows. We have successfully initiated a stakeholder dialogue platform in Bamenda, Cameroon. On the 29th of August 2017 we have held a core group meeting with representatives from relevant ministries and Bamenda City Council, Cameroonian researchers, and civil society members. During the meeting working groups debated about the characteristics, constraints and problems of urban and peri-urban agriculture in Bamenda and defined areas and stakeholders of interest. Based on this information, we held our first multi-stakeholder platform meeting and dialogue facilitated by RUAF and SHUMAS on the of 17th of September 2017. At this dialogue, Annika Witte gave a general introduction to the project “UrbanFoodPlus” and postdoctoral researcher Hannah Karg presented preliminary research results from the food-feed-wood-flow survey and a research assistant of SP 3, Julius Forchid, presented results on dairy production. Furthermore, a lively discussion was facilitated by René van Veenhuizen that provided the space to discuss with farmer representatives, Cameroonian researchers, town planners and state authorities about the role of urban and peri-urban agriculture and the way forward for creating a policy narrative that will tackle identified challenges and constraints. For more information on this meeting, download our report of the multi-stakeholder dialogue. Florentin Zong-Naba investigated the social processes of appropriation and usage of agricultural technology by urban farmers in Ouagadougou. His thesis highlights how vegetable farmers improved their wellbeing through the introduction of fertilizers into their actor-network. He defended his Master thesis in Sociology with the title “Stratégies sociales d’adoption et d’utilisation des technologies agricoles en milieu urbain: cas des fertilisants agricoles dans les sites maraichers de Ouagadougou” on 26th of July 2017 at the University of Ouagadougou. 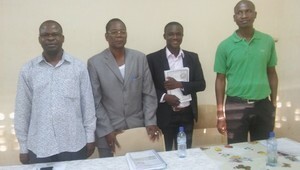 On his thesis committee were Dr. Alexi Kaboré, Pr Jean-Baptiste Ouedraogo and Dr. Gabin Korbéogo. Dr. Imogen Bellwood-Howard co-supervised this research project together with Dr. Gabin Korbéogo. Following a first exploratory trip of IEE researchers Nicole Dittrich, Marc Hansen and Tobias Thürer to Cameroon in June 2016, we are currently expanding our research activities to Bamenda. The field work for the two WTP studies in Bamenda began in mid-March 2017 and is currently being carried out by the two RUB students Diana Tuchak and Arne Nasgowitz, who will have finished their work by the end of May 2017. 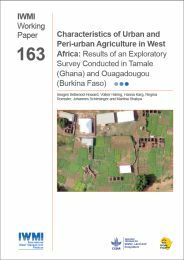 As in Ouagadougou and Tamale, each WTP study targets a sample of 300-350 randomly selected households, using a spatial, GIS-based sampling approach. Between the 21st and 23rd of June 2017, University of Goettingen hosted the fourth annual Summer School of the BMBF-funded project UrbanFoodPlus (UFP). Close to 50 participants came together at the Institute of Social and Cultural Anthropology and the Conference Centre at the Observatory for three intensive days of presentations, workshops, discussions and planning sessions. 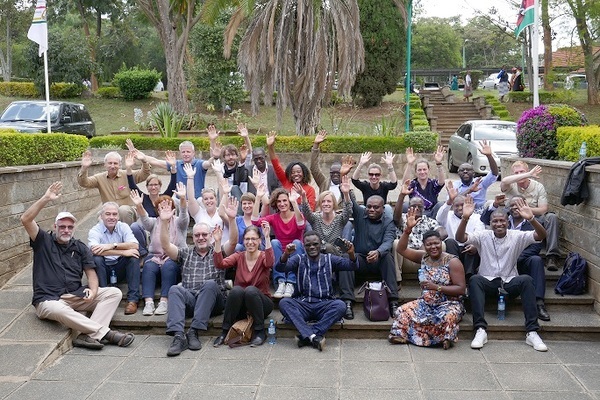 The summer school facilitated exchange between German and African researchers based in Germany and the project’s African and international partners. The thematic focus of the summer school was on building and sharing knowledge in urban agriculture. Researchers from all sub-projects presented their findings and on-going projects in posters and presentations. 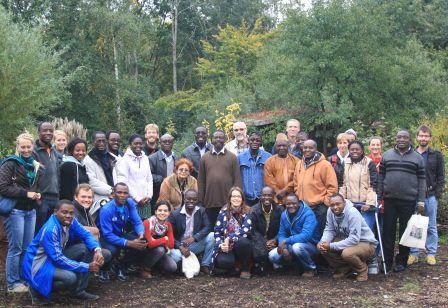 Partners and researchers worked together in activating sessions aimed at discussing the project’s role of transmitting research outputs to non-academic stakeholders such as policy-makers and farmers. Participants reflected on the intricacies of multi-stakeholder engagement processes as experienced in Tamale and Ouagadougou and the impact of their own research. Building on these lessons learnt participants set a time frame for activities in Bamenda. In view of the project’s aim to promote the academic qualification of young scholars, the Summer School offered a workshop on the management, publication and citation of data. As a novelty, the Summer School also offered a session for Postdocs on lessons learnt and potentials in data management within the project. 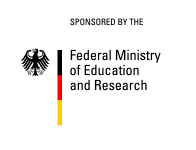 Both workshops were given by the eResearch Alliance of University of Goettingen. The Summer school offered the opportunity to engage with Social Anthropology as a discipline through a customised guided tour of the Ethnographic Collection – one of the most significant teaching and research collections in the German-speaking sphere. The tour gave insights into the embeddedness of food production in social and cultural systems and it highlighted the collection process through expeditions – in their own ways early interdisciplinary enterprises. 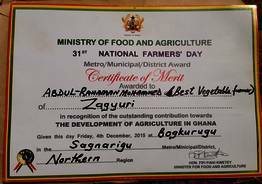 Mr. Abdul-Rahaman Mohammed, one of the farmers maintaining the UFP Central Experimental Field was awarded as the Best Vegetable Farmer for the District during the 31st National Farmers’ Day in Tamale, Northern Ghana. Mr. Mohammed (second right in the picture) was presented with a certificate, safety boots and some roofing sheets. The Farmer’s day was celebrated under the theme “Transform Ghana: Invest in Agriculture’’ to honor farmers and fishers throughout the country for their various contributions to national development. Another farmer, Mr. Mohammed Abdallah (first on the left in the picture) was elected to represent his community as Assembly Man. Assembly men/women are elected by their communities to spearhead development projects in their communities. The third annual Summer School of the BMBF-funded research project Urban FoodPlus (UFP) took place from 4th to 9th October 2015. Alternating between West Africa and Germany, this year's summer school was hosted by the IEE at the RUB's Blue Square, in the city centre of Bochum. With more than 60 participants, the summer school brought together a wide range of stakeholders from 13 different countries, including researchers and project partners from UFP's four focus countries: Burkina Faso, Cameroon, Ghana, and Mali. The summer school, provided the opportunity to take stock of an ample range of preliminary research findings from UFP's sub-projects. Several sessions of the summer school were reserved for the planning and discussion of future activities among the project partners. One primary objective of UFP's annual summer school is to promote the academic qualification of UFP's PhD candidates. Apart from their scientific contributions (presentations and posters), the PhD candidates participated in workshops on scientific writing strategies, promotion of interdisciplinary research and statistics. The summer school participants learned about the history and current role of allotment gardens in Germany during a half-day excursion on urban agriculture in Germany. This revealed interesting links to current needs and developments in West Africa. 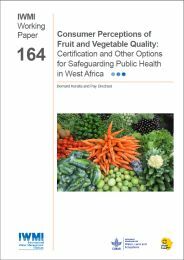 Consumer perceptions of fruit and vegetable quality: certification and other options for safeguarding public health in West Africa. During April, May and June simple equipment was constructed (instructions from the BiocharPlus project) to carbonize crop residues. Saw dust, corn cobs and rice husks were successfully carbonized. Twelve farmers received carbonization drums in Tamale. The farmers produced biochar from rice husks and use it on controlled fields in comparison to their normal agricultural practice (NAP). The experiment will provide information on the agronomic benefits and feasibility of biochar production and use in urban vegetable production. Amaranths are vegetables commonly grown in urban gardens of Ouagadougou – Burkina Faso. This plant withstands the hot conditions and is therefore among the farmers’ preferred crops during the hot dry seasons. The second successful harvest has been completed 10th of March. This time the plants had broader leaves and bigger stems than during the first cycle (hotter conditions). The control plots hardly produced any marketable yields. 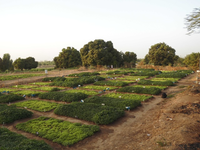 The aerial photograph shows the experimental field in Ouagadougou. Fertilization is clearly seen by the dark coloration of the amaranths. The meeting provided an overview of ongoing biochar research in Africa (download the agenda here). UFP researchers, Désiré Lompo, Edmund K. Akoto-Danso and Kofi Atiah will presented UFP research which was received with much interest froma ll participants. UFP researchers were trained in building and operating pyrolytic stoves. UFP and BiocharPlus will explored further opportunities for collaboration. The production of carbonization barrels together with farmers and the assessment of its agricultural use is planned to start in April 2015. Hanna Karg and Johannes Schlesinger were invited to participate in an expert consultation on city region food systems (CRFS) at FAO headquarters in Rome. Based on their experience in the fields of GIS/remote sensing and food flow surveys, they will contribute to the establishment of a standardized assessment methodology for CRFS. 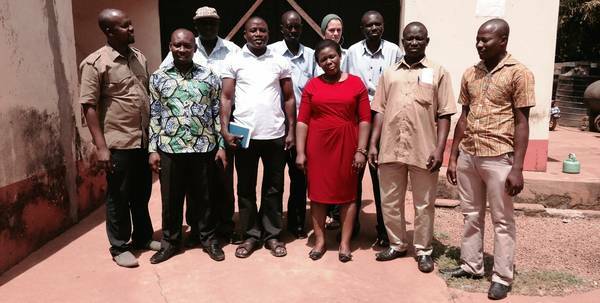 On 19th February, a core group of stakeholders met in Tamale at the Urban Agriculture Network offices. The aim of the meeting was to deliberate on the implications of current UPA research for policy. The group undertook to formulate policy recommendations that will be presented to the wider stakeholder platform in a meeting at the end of March. 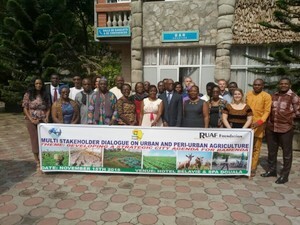 The core group reviewed research from IWMI and listened to presentations from UFP and UDS. The recommendations made at the meeting concerned diverse areas of UPA, from land through pollution and marketing to institutional development. Members of the group represented Tamale and Sagnerigu town and country planning departments and district assemblies, the Environmental Protection agency, the ministry of agriculture and farmer groups. Louis Amprako investigated ecological abundance and family richness of spiders in thirty two okra fields, in and around the rural, peri-urban and urban areas of Ouagadougou and Tamale. He defended his Master thesis "The impact of landscape characteristics on biodiversity of spider communities in okra fields along a rural-urban gradient in two West African cities" in January 2015. Ms Renate Sophie Lippmann graduated with a Bachelor of Science degree. 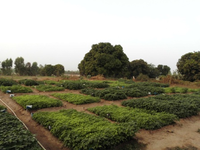 Ms Lippmann titled her thesis "Changes in plant diversity and management practices of okra agroecosystems along the rural-urban gradient of two West African cities".